The squadron took off from their base in Molesworth, England in the early morning of a clear sky. It was Alan’s seventh mission, and as they entered French airspace, he crammed himself into his ball turret – and not a moment too soon, as 25 to 35 Messerschmitt Bf 109s zoomed in on them. The Americans took out 12 (and possibly another seven), severely damaging one. Snap! Crackle! Pop! made it over the target area before a 109 raked its right wing, shearing off a section of it. More bullets burst through the thin Plexiglas, hitting Alan. Desperately scrambling out of his turret and onto the flight deck, he groaned at what he saw – a gap had been torn open on one side of the bomber. Then the plane shook and began its downward death spiral. So Alan ran to get his parachute… but it just wasn’t his day. It, too, had been ripped to shreds by German flak. As the bomber continued to plummet, he could only shrug, take a deep breath, and pray. Then he jumped through the new opening, praying even more before he blacked out. Down below, people were out in the open, waiting for the raid to end. Those standing near the Saint-Nazaire railway station looked up and scrambled away as a new object hurtled their way. But as it got closer, a few realized that it wasn’t a bomb. It was Alan. After falling for about four miles, his unconscious body made a beeline toward the station’s beautiful glass skylight which was still miraculously intact – though not for long. Alan punched a hole through it before landing with a thud on the station floor. He later woke up before a still-stunned German doctor who promised to do everything he could to save the airman’s life. And the doctor kept his word. Despite suffering 28 shrapnel wounds, a broken nose, a ripped-off eyelid, a punctured lung and kidneys, a broken right leg and ankle, as well as a right arm almost torn out of his torso, Alan survived. As to the German authorities, they were so in awe of him that according to Alan’s own accounts, he was treated very well. Not that it stopped them from throwing him into a POW camp till the end of the war. Of the 85 bombers that LeMay used, 76 hit their mark at a cost of 47 permanently damaged planes and seven downed ones, including Snap! Crackle! Pop! But while they leveled the surrounding area, they barely scratched the U-boat pens which now serve as a tourist attraction. 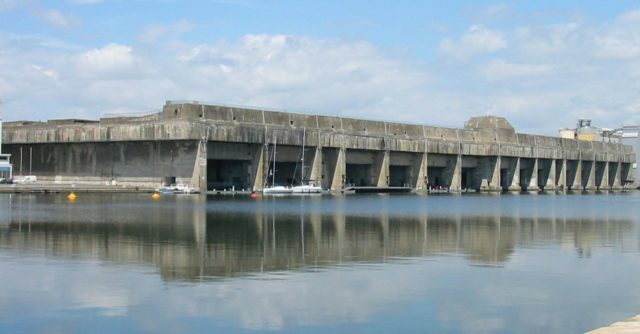 Despite the fact that almost 90% of Saint-Nazaire was obliterated by war’s end, its residents made a monument to the Snap! Crackle! Pop! and its crew. They then welcomed Alan back on January 3rd, 1993 for the dedication. And though he participated in their town’s destruction, they made him an honorary citizen of it. Alan later died on December 20th, 2003 at the ripe old age of 84.